Make some noise Android users, because today is the day that we are waiting for, I guess! Blackberry Messaging App (BBM) is now available for download in the Google Play Store. After a month of delayed, BlackBerry Limited, the developer of BBM app finally released the Android version of BBM. 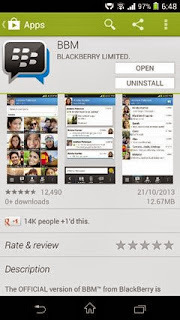 You can now enjoy chatting with your friends using BBM even your smartphone have Android OS. BBM for iOS was already available in the iTunes App Store since the first day they announced the released of it. For the meantime, please bookmark this page now or visit this site more often for you to be updated. You may also share this post to your friends so they may know about BBM for Android is now Officially Available. Comments or suggestions about "BBM app for Android is now Officially Available for Download" is important to us, you may share it by using the comment box below.